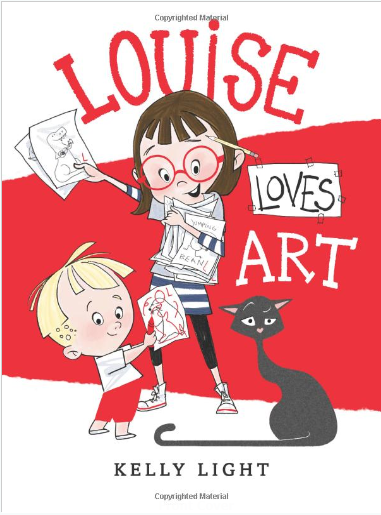 Louise Loves Art by Kelly Light is an incredibly cute book we stumbled across at the library (published in September) and was so cute we are currently maxing out our renewals on this superb book. First of all let’s start with the best first line I’ve read in a while. I love Art! It’s my imagination on the outside. Are you sold yet? Let me tell you a bit more, Louise is adorable, she loves to draw and one of her favorite subjects to draw is her cat, Louise perfectly captures the cat-ness. She is a very confident young lady and is creating masterpieces for her art show. Her little brother Art, like most littles, wants to be a part of what she is doing, he wants to create a masterpiece too. Although, his masterpiece causes a little bit of tension. Louise is a fabulous big sister and realizes what Art was trying to do and makes him feel special, because clearly he loves his big sister. I love this book because sometimes it is hard to remember that little brothers or sisters just want to be with you. This book is a nice reminder of what it looks like to be a great older sibling. It is also a great story because Louise is confident, she creates masterpieces and inspires her little brother. In the end they work together to create their art. This book would be really fun to read to a class who is creating their own masterpieces. Another reason why I love this book is the vocabulary that Ms. Light uses: masterpiece, pose, capture, fierce, feline, piece de resistance and gallery. These vocabulary building words and great! I love that my petite learned some new words reading this book. Even more I love that after reading it she wanted to get into her art bin and start creating her masterpiece. Get Creative: need a little art inspiration? Here are some projects that you and the petites can create.